At the Sanchez Law Office we take a simple approach to delivering legal services. First, we are educators. We will take the necessary time to explain bankruptcy laws in a way anyone can understand. Second, we provide you direct access to an experienced bankruptcy attorney. Attorney Alexander Sanchez will not hide behind inexperienced associates or legal assistants. Having a single point of contact reduces legal errors and makes for a smoother client experience. And, finally, we offer simple and easy to understand legal fees that are designed to be affordable. We limit our overhead costs and pass the savings on to you! 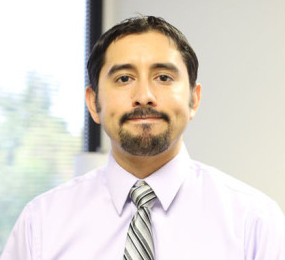 Mr. Sanchez has been assisting families and individuals in Arizona since 2010. Previous to his legal career Mr. Sanchez worked for the financial industries sector acquiring his series 7 and 63 licenses. Mr. Sanchez regularly goes out of his way to make the bankruptcy process for his clients as smooth as possible. He strives to treat all of his clients with dignity and respect. With over two decades of customer service experience, Mr. Sanchez knows how to treat his clients. 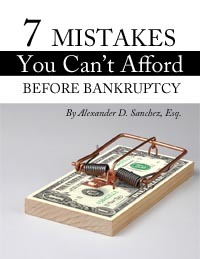 Since 2010, Mr. Sanchez has been the lead attorney in over 2,000 successful bankruptcy discharges. *Conditions apply. Click for details. Why is Bankruptcy Sometimes Necessary? Imagine a world where no mistake you every made or misfortune you encountered could be made right. We have all taken risks and gambled with our future. These decisions are usually based on our level of experience and temperament. Tech folk heroes like Bill Gates, Steve Jobs, and Mark Zuckerberg all took incredible financial risks that were ultimately wildly successful. Arguably, the world is a better place because people take assertive risks. But for every success story, there are also countless failures. And that is not necessarily a bad thing! Failure is an integral part of future success. How we react to our failures is much more important than the failure itself. A close relative of failure is tragedy. Tragedy is no respecter of persons. No one is immune from tragedy. Medical issues can affect anyone at any time. And while we do not like to think about the cost of treating serious medical issues, the costs nevertheless continue to climb. By some accounts, medical costs in the United States have already surpassed 18% of gross domestic product (GDP) or about 3.2 trillion dollars a year! These costs are only projected to grow. Many industries are also periodically affected by downturns in our economy. Some risk takers find themselves over leveraged, but even blue collar workers who always played it safe can often meet financial tragedy when extended layoffs eat into their savings. Any one of us can fall victim to the ups and downs of this capitalistic economy. And while filing bankruptcy should never be taken lightly, I for one am very grateful that an escape valve exists that prevents the economy and the lives of honest people from completely blowing up. If you or someone you know is experiencing financial hardship, contact us to set up a free bankruptcy evaluation. We will gladly meet with you to discuss the pros and cons of a bankruptcy filing and help you plan your next steps toward a financial fresh start. Judgment creditors have a right to garnish up to 25% of your net wages. Your bank accounts can also be levied by judgment creditors. Both Chapter 7 and Chapter 13 will put a stop to these collection methods. Junk debt buyers are subject to federal regulations. However, many of these types of creditors regularly cross the line in their zeal to collect money. Both Chapter 7 and Chapter 13 put an end to this madness. If you have fallen behind on your mortgage payments, then lenders have the right to begin foreclosure proceedings. In AZ you are entitled to one 90 day notice. Chapter 13 is generally the best option to save a home that is going into foreclosure, but Chapter 7 will also provide some temporary relief. If you have fallen behind on your vehicle payments, then lenders have a right to repo the car. Chapter 13 is generally the best means of saving a car provided the case is filed within 10 days of repossession.